Cornflowers (Centaurea spp.) are small, free-flowering annuals with delightful sky blue flowers. They are easy to grow by seed and make a long-lasting cut flower, even retaining their color when dried. Cornflower seed is widely available in garden centers and seed catalogs, where it is also commonly referred to as bachelor buttons and occasionally by other names, such as basket flower of bluebottle. They are annuals for the summer flower garden, growing from one to three feet tall, depending on the variety. As an annual, they are suitable for all USDA zones. The foliage is spindly and nondescript, composed of inch-long lance-shaped leaves. They are grown primarily for their flowers - one to two-inch round clusters comprised of numerous tiny flowers - which bloom from early summer until the first frost. Coneflower seed can be sown directly in the garden as soon as the ground can be worked in spring. They are not picky about soil, but benefit from a bit of compost being worked into the planting area. Plant the seeds about a half-inch deep and six inches apart in a sunny or partly sunny location. After they sprout, thin the weaker seedlings, leaving the rest spaced about 12 inches apart. 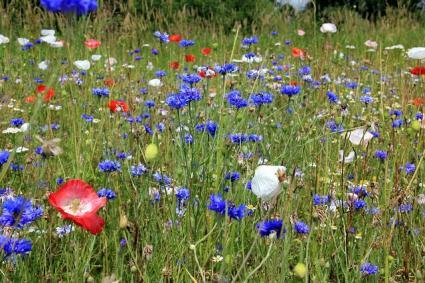 Cornflower seed can also be incorporated into wildflower mixes and broadcast over large areas. Cornflowers are typically combined with other annual flowers or mixed in with larger perennial species as an attractive filler. 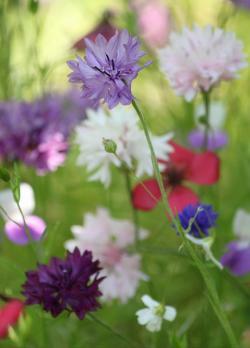 Plant them in wildflower meadows, cottage gardens, and perennial borders. They are one of the best species to include in beds for cut flowers. Cornflowers are very low maintenance plants though they do need regular irrigation throughout the summer to thrive. Removing the flowers as they fade will help to encourage repeat blooming. If you allow some seedheads to dry on the plants at the end of the growing season, they will likely sew themselves and return to the garden next year. By late fall, the spent stalks can be pulled out or cut to the ground. Pests and disease are of minor concern with cornflowers. Aphids may show up, but are rarely too troublesome and can be dispatched with a sharp jet of water or an insecticidal soap spray. Powdery mildew can occur in hot humid places and is best dealt with by destroying any plants that become badly infected to prevent it from spreading. Cornflower is occasionally used for medicinal purposes, especially the flowers, which are used as an eyewash. 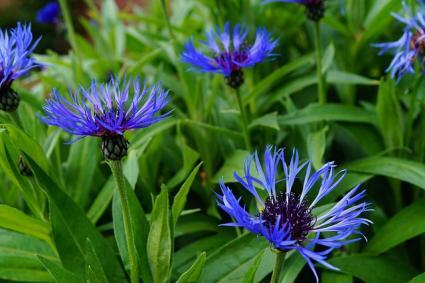 If growing cornflower for this purpose, use the common species (Centaurea cyanus), rather than one of the hybrid cultivars, and harvest the flowers in the morning just after they open. Cornflower has been developed into a number of named cultivars and hybrids that offer different colors besides the traditional blue form. Mixing different colors in a single planting makes the colors more impactful. 'Burgundy Beauties' has a mixture of deep purple and whitish flowers on plants about three feet tall. 'Dwarf Blue Midget' is a blue flowered form that reaches only 12 inches tall. 'Florence Mix' is also just 12 inches tall and has a mix of white and pink blossoms. 'Almost Black' has deep purple-burgundy blossom on plants to three feet tall. Cornflowers are not large and spectacular, but they are brightly colored and cheery-looking. They are priceless as cut flowers and for inclusion in naturalized meadow plantings.